Let’s just say this upfront: Unless you skip almost every story beat, you will watch Asura’s Wrath more than you play it. Even then, then experience lasts around half a dozen hours. It’s also the kind of crazy that only a Japanese anime-inspired product can be. With those statements alone, you may already know whether or not you want to stay away from Asura’s Wrath. But there’s a lot to like about this unique package, and if you’re the kind of person that loves Dragon Ball Z, Asian mythology and quick-time events, you’ll probably love this game. Asura’s Wrath features an interesting mix of Hindu and Buddhist imagery combined with science fiction elements like spaceships and futuristic weaponry. The titular Asura has been betrayed by his fellow demigods, framed for the murder of the emperor and kicked out of fake future Heaven, causing him to lose everything he cares about. Understandably he’s a little pissed, and he comes back 12,000 years later to get revenge and maybe save humanity along the way. The game is a weird mishmash of systems and concepts. The majority of the game is made up of long cinematics that occasionally have you pushing a direction on the left stick or mashing a button to cause an action. You’ve also got sequences that play out as an on-rails shooter, and some of the most interactive parts of the game feel like a standard action game. You have light attacks, long ranged attacks and a heavy attack that requires a cool down period after each use. You can counter some attacks with a button prompt and dodge most others. It’s simple, but it works in short bursts. As you fight you will build up two meters: an Unlimited Gauge that lets you use your heavy attack as often as you want and a Burst Gauge that allows you to get really, really angry. Building up that Burst meter constitutes the bulk of the interactive action in Asura’s Wrath. There are many instances where the story doesn’t progress until you’re sufficiently powered up, allowing you to go Super Saiyan harness your wrath and blow through an obstacle, whether it’s a wall or a giant monster. So you punch a lot of things and kick a lot of other things until huge text in the center of the screen shouts at you to hit the button to make cool stuff happen, then cool stuff happens and you move on. 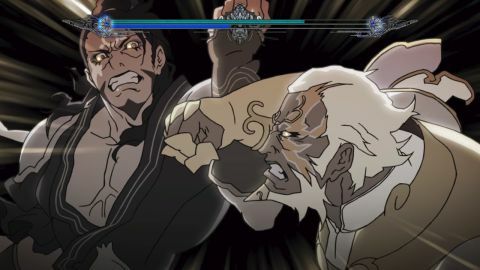 Asura’s Wrath comes across like an interactive anime mini-series. It’s episodic to the point where it has commercial break-like pauses and “Next time on…” segments at the end of each chapter. This isn’t an original concept by any means, but the television vibe is definitely strong. The parts where Asura’s Wrath is a game take a back seat to the parts where it just looks cool. In fact, each episode typically features less than 10 minutes of non-cutscene gameplay. So why should you care? If the majority of the game practically plays itself, why bother? Because Asura is a badass, that’s why. This guy is always ready to fight, whether he’s fighting with two arms, six arms or no arms. Even being stabbed with a sword the length of Earth’s distance to the moon isn’t enough to take him down. Sounds crazy, right? In some ways it feels like the best Dragon Ball Z fan fiction ever written, or the most epic and drawn out Final Fantasy summon animations. But that’s what makes Asura’s Wrath awesome, even when you don’t have control of every moment. The emphasis on quick-time events wouldn’t be nearly as appealing if the events weren’t so stylized and over the top. The game could have featured some relatively bland fights and set pieces, but instead it opens with a monster bursting out of a planet. Hell, we counted three different “Press Start” screens, two of which came after starting the game proper. End credits also rolled more than once. It can be hard to know what to expect. And despite all of the insanity and seemingly incomprehensible action, we found ourselves caring about the characters more than we expected to. It’s not just a story about revenge. It’s a story about humanity, a father fighting for his daughter and sacrifices made for the greater good. The game may be short, but it ends before it outstays its welcome. There’s some unfortunate repetition of a few moments as a result of its emulation of TV episodes, and the combat itself isn’t too deep, but there are few dull moments and the screen will be constantly filled with action. If you’re anxious to get more gameplay you can go back to replay chapters for higher scores or with different Gauges that might make the game harder and which unlock achievements and trophies. It may be tough to justify paying full price for Asura’s Wrath’s limited interactivity, but it has a lot of style to fall in love with. Description Asuras Wrath features an interesting mix of Hindu and Buddhist imagery combined with science fiction elements like spaceships and futuristic weaponry. The game is a weird mishmash of systems and concepts. The majority of the game is made up of long cinematics that occasionally have you pushing a direction on the left stick or mashing a button to cause an action. Youve also got sequences that play out as an on-rails shooter, and some of the most interactive parts of the game feel like a standard action game.